I'm very pleased to announce that the overwhelming majority of responders wanted to make the Schoolhouse Tunic by Sew Liberated! 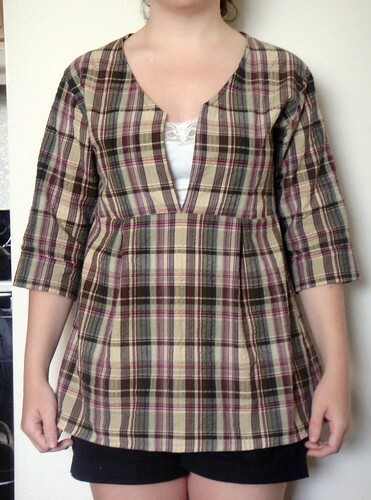 This is a fantastic pattern, especially if this will be your first garment experience! Meg was so gracious in allowing me to lead a sew-along, and she has also offered a 10% discount on her website to buy the Schoolhouse Tunic pattern! Their discount code section is currently experiencing problems, so to receive the discount please email orders [at] sewliberated [dot] com and mention that you are participating in the sew-along at Sew Festive Handmade. Meg and her team will then issue you a refund via Paypal. The sew-along will officially kick off on Monday October 8th, leaving you over 3 weeks to purchase and receive your pattern and fabrics. I will be posting this upcoming Monday, September 17th about the variety of fabrics you can choose to use on your tunic and will have a fancy schmancy button by then too! We will work through the pattern in a total of 4 Mondays, so that by Monday November 5th you should have either a tunic/shirt/dress! Then on the 5th of November I will host a link-up here so that we can all ooh and ahh over everyone's fantastic garments! -November 5th - Link up your finished Schoolhouse Tunics back here! Each of the days will include pictures of each step of the process, along with tips and tricks from me. I will specifically be addressing things that I think might throw a quilter off during the sewing, along with just general information. And because this is such a versatile pattern, I'll also be walking through the various adjustments and modifications you can make to the pattern so you can have a completely original Schoolhouse Tunic, such as sleeve differences, embellishments, etc. I am soooo excited! I've given up on the idea of sewing clothes for myself, too many alterations are necessary for a good upper body fit. However, my daughter now fits an adult XS, so I will be making one for her! I even ordered some really cute AMH fabric at a good discount earlier this week. Perfect timing! I want to join in but it really depends on time! I will definitely follow along and read posts!